"....Odneal was a delightful addition to the Maynard Ferguson Band's European tour in 1980. He's a talented performer and a great personality who is welcome on the bandstand with me anytime!" Last night I presented a CASUAL DOUBLE HIGH 'C" clinic in Houston (Sugar Land) at Dulles High School to fill in for Roger Ingram who was scheduled to be there. It was great to see all the interested trumpet players who came out and "braved" Houston traffic to attend. This was the first clinic where applied my CDHC technique to piccalo trumpet to show how it is not just for lead and high notes! Thanks to Kenny Borak and H & H MUSIC for having me out! Hey guys, I drove over there and yes I was expecting to see Roger, but let me tell you, Bob Odneal did a good job of talking about his Casual Double C. He kept us laughing with his joke interjections, (well the young students might not have got it all, you have to know Bob). I am sure when the young students first heard Bob play his warm up of the appeture they no doubt thought this is a crock, play with that kind of sound. Well he showed them where it all leads to and well if it works for him, it could work for others. 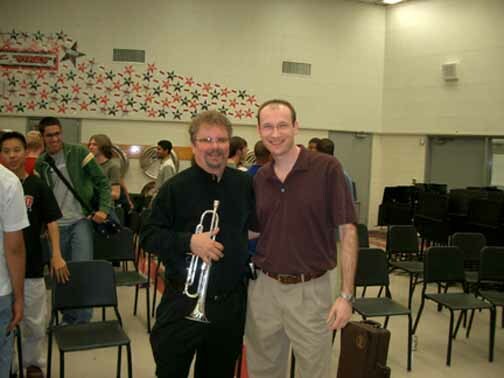 Yes I was dissapointed that Roger wasn't there but I did enjoy what Bob had to say and well maybe we need to try and do some more trumpet summits here in the Houston area, we have plenty of fine players that can pass on how they have developed their playing abilities over the years. I believe that one can learn from listening to others about what they have gone through and what they do now to develop and maintain their chops. 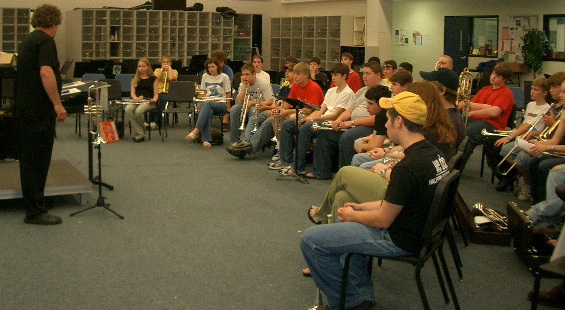 I had a great time giving a clinic and playing with the Brazoswood High School Jazz Bands and the Lake Jackson Intermediate Jazz Band on May 19th & 20th 2004! Thanks to all involved! Special thanks to Jim Kock, Brian Casey and Audry Dunn. This was my 3rd time to work with these groups. CASUAL DOUBLE HIGH "C" is a method I have been developing since 1990. It is the easiest way to play the trumpet I have seen in my 35 years of playing the instrument. I began to develop MY own approach after a phone conversation with Jerome Callet. His ideas were different from any of my other teachers. The embouchure is formed in a way as not to let the lips be stretched! When the lips are pulled back at the corner, the center thins out and becomes easily crushed by too much mouthpiece pressure. DURING MY PRACTICE, THE APERTURE IS SO TINY THAT THE AIR FEELS AS THOUGH I HAVE A TINY LENGTH OF THREAD IN MY MOUTH AND I AM PULLING IT OUT BETWEEN THE LIPS. THIS IS WHAT PROVIDES THE FOCUS THAT IS USED TO PRODUCE THE UPPER NOTES ON THE TRUMPET! I hope this page can help some people learn what I have spent a lifetime (well, not yet) searching for!